St.Martins of Porres & Our Lady of Muswell again organised exciting focus weeks to enthuse, motivate and inspire their students, to try a new leisure activity and lead healthy lifestyles. St.Martins Yr.3 & OLM Yr6 visited Alexandra Park School, and demonstrated their speed and agility by taking on a range of assault courses and team challenges. 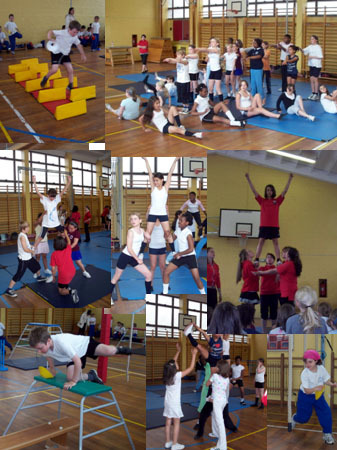 This was followed up with a work out in APS’s Fitness Suite, and a Cheerleading Workshop. Thirty students from OLM Yr 5 & 6, performed a polished routine for parents, after learning dance moves and stunts, choreographed by senior cheerleading coach & founder of the APS Tigers, who have gained National honours. All spectators were very impressed with the standard after only an hours practice. It is always a pleasure to invite local feeder schools to Alexandra Park School to share our facilities and PE staff expertise.